The Sella-Granata Art Gallery presents a dual exhibition of the works of Knoxville, Tennessee painter Eleanor Aldrich and Baton Rouge, Louisiana ceramics sculptor Dennis Ritter, September 8-29, 2016. Each artist presents a way of seeing and thus giving meaning to ordinary, everyday objects. The public is invited to a reception held September 8 from 4 to 6 p.m. at the gallery. I use objects of everyday labor and leisure as subject, material and metaphor. My models include mops, push-brooms, lawn chairs and napkins. Mops reference the large paintbrushes of the Abstract Expressionists, and the janitorial work that must be done in an exhibition space. Lawn chairs are the grid; the sublime works of linear minimalism, and the place a body sinks into after a long day. 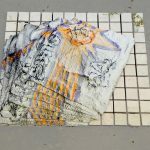 The napkins, made of plaster wrap and pigment are a material reference to painting’s great Renaissance frescos, but in subject are the detritus usually left after an art opening. Non-Prophet plays with the idea of the labor that happens in DIY or non-profit spaces, and its homonym—prophet— which implies the speaking of truth to power, and has a spiritual connection. My work grapples with truth through its use of the actual against illusion, and by presenting the complexity of fine art in relation to the politics of labor; as painting is both labor and leisure. My work is anti-prophetic in that it isn’t instructive; rather, it lays out the complexities of reality, power, and mystery in a way that is at times funny, revolting, and beautiful. Eleanor Aldrich was born in Springerville, Arizona. A participant at the Skowhegan School of Painting and Sculpture in Maine, she also holds an MFA in Painting & Drawing from the University of Tennessee, Knoxville, where she currently lives. She earned her BFA in painting and drawing through the Academie Minerva (Groningen, the Netherlands) and Northern Arizona University in Flagstaff. She was a participant in the Drawing Center’s first Open Sessions. Aldrich has had solo shows in Boston, Knoxville, and Flagstaff, AZ. Her work has been shown at Saltworks Gallery (Atlanta, GA), the Drawing Center (New York, NY), Grin (Providence, RI) and Ortega y Gasset (New York, NY). Her work was chosen for 1708 Gallery’s FEED 2013 (Richmond, VA). She has been awarded an Endowment for the Arts through the Whiteman Foundation, and the Herman E. Spivey Fellowship. Her work has been included in New American Paintings and on Artforum.com. Aldrich’s website is here. Objects and our relationships to them form the foundation of humanity. The innate ability to recognize and categorize everyday objects allows one to navigate the mundanity of daily life. Domestic spaces become ordinary and the objects that fill them are taken for granted. Daily Objects looks at the unseen effect of these objects on the constructs of memory, recollection, and as the signposts of the physical world. Dennis Ritter is a sculptor working primarily in the ceramic medium. He lives in Baton Rouge, LA, and maintains an active studio practice and is an adjunct lecturer at Baton Rouge Community College. Dennis received his MFA from the NYSCC at Alfred University in 2015. 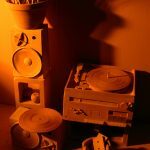 Prior to attending graduate school he worked as a teaching artist for The Claymobile Outreach Program in Philadelphia, was the Studio and Facilities Manager for The Clay Studio in Philadelphia. He received his BFA in Ceramics from the Tyler School of Art in 2012, where he received the Rudy Staffal Award for Excellence in Ceramics. He has also been a resident at Watershed Center for the Ceramic Arts and The Vermont Studio Center and was awarded a Windgate Fellowship in Craft in conjunction with The Vermont Studio Center residency program. Ritter’s website is here. 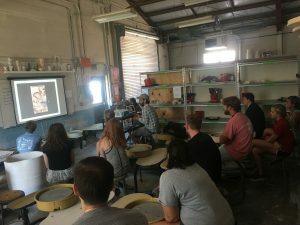 Photo to right: Ritter lectures to ceramics students during his visit. Funding support for the Sella-Granata Art Gallery comes from the Department of Art and Art History and the College of Arts and Sciences. Admission to the gallery is free. Hours are Monday through Thursday 10:00 – 4:00 p.m. The gallery is located at 109 Woods Hall in the heart of the UA campus on Woods Quad. Information about visitor parking is available here:http://bamaparking.ua.edu/visitor-information/. Parking is free on campus in a legal space after business hours. For more information, contact the gallery at (205) 348-1891 or go to http://art.ua.edu/gallery/sgg/.